Happy July 4th! I hope everyone had a great holiday. Today was just a typical day for us. After I ate breakfast, I started my day with a four-mile easy run. Again, my only goal was to keep my heart rate under 148 beats per minute, regardless of what pace that ended up being. It was very humid this morning, and I almost turned around and went right back in the house to use the treadmill. But after the awesome run I had on Monday, I was actually looking forward to a repeat of that today. I set my Garmin to just show me my heart rate and heart rate zone while I was running, so that I wouldn't see my pace and let that influence me to go faster. I had absolutely no idea what pace I was running, but I was doing really well at keeping my heart rate where it should be. A couple of times, my watch beeped to tell me my heart rate was too high, so I just focused on slowing down a little. I always tend to speed up my last mile of any run, because I know I'm getting close to home. But today, I was really focused on keeping a steady heart rate. When I got home, I checked out my stats. My average heart rate was 143, which was great. My pace was 10:22/mi, which kind of surprised me, because I felt like I was going much slower than that. A good run! This afternoon, I found some old home videos (on actual video tapes, not digital), so Jerry, the kids, and I ended up watching them for a couple of hours. There was one of Chandler when he was a kitten, and when Chandler saw what was on the TV today, he was fascinated by watching himself. It was kind of funny! Jerry and I were in a lot of the videos of the kids, and I was in total shock at how we used to look. It was really sobering to see just how big we were! On the video, I could actually hear myself breathing heavily, and a couple of times, when I got up from the couch, I made a groaning noise because it was difficult for me to do. The kids were really surprised to see us like that on the video, too; they don't remember what we were like before we lost the weight (which I'm happy about). When I got too heavy for my regular clothes, instead of buying bigger ones, I just started wearing Jerry's 2XL work shirts. I kept telling myself, "When I lose the weight, I'll buy cute clothes," but I went for years without losing the weight. When I finally did, I swore I'd never wear another of his work shirts again--and I haven't. It's exciting to see our half-empty closet! I used one of the pictures Stephanie took of me recently to create another before/after photo. It feels like a lifetime ago, but next month will mark four years since I started losing weight. Love the new before and after!! Looks awesome! 4 years went by quickly for me! It really makes the quote "A year from now you will have wished you started today" ring absolutely true. So glad I finally put my foot down and MADE it happen! So where is Jerry going to be working? Home movies are SO much fun. At family reunions, my cousins and I (now ages 18-22) always watch videos of when we were little. That's really cute that your cat watched one of himself! I love that before and after picture, look how happy you are! I was looking at some pictures the other day and it really confirmed that even thought the weight loss has been slow, it's definitely been steady! seeing such a chubby person is scary because I didn't even see myself that way!! Kate, I love your before and after picture! You have been such an inspiration to be over the last 2 years. 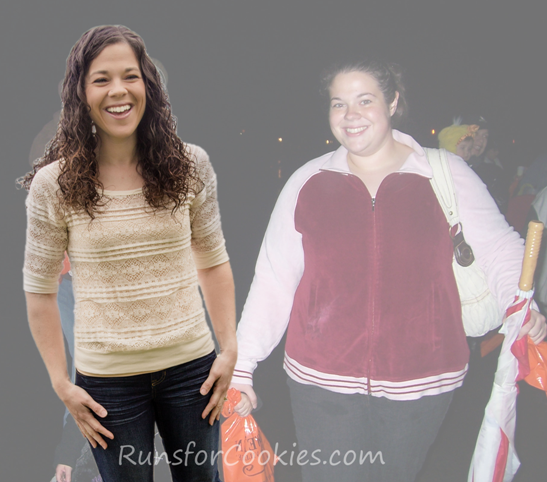 I started Weight Watchers 2 years ago and after starting I searched for some blogs to read to keep my motivated to show me that real people could do this. I have lost 90 pounds! I have hardly ever missed a day reading for posts! Thanks for being you and being a light of guidance and motivation in day!